The following design process takes a sample complex intersection and details how to understand its existing function, analyze its movements, identify opportunities, and create a new design. Driving this process is the underlying need to let land use, community desires, and usage determine solutions. Map vehicle movements and turns to understand how motorists are using the intersection. Overlay volume data to illustrate the relative importance of each movement, looking for low volume turning movements in particular. This process does not need to be data intensive or time consuming. Transportation agencies typically have access to volume and signalization data. Pair this with observation an understanding of the local planning context and how the street fits into the overall traffic network. 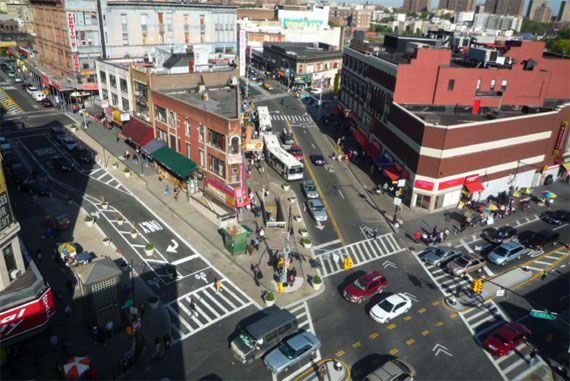 Document how pedestrians use and activate the intersection as a public space. Where are people gathering, sitting, and talking? What activities are they engaged in? Which public spaces attract people and which do not? Overlay how pedestrians actually move through the junction and the volumes of those movements. Where do people actually cross the street? How many people? In what direction? In this case, a train station is located at the northeast corner of the study area, which attracts large volumes of people on foot. In urban locations with continual activity, this step can often be accomplished by 15–30 minutes of observation. Assess the volume and movement of cyclists as part of the planned and existing cycling network. Document bus headways and volumes, as well as the placement and location of bus stops. If there is a traffic signal, plot the phases to show how the intersection flows. Obtain phasing data from the appropriate agency, or, if phasing data is not available, the general timing plan can be ascertained with a stopwatch. Note whether pedestrian and vehicle signals are fixed or actuated. Observe how well the phases match volumes, how people comply, and when signals give priority to drivers, cyclists or pedestrians. Note the trade-offs made in giving more time or protected signal phases to particular modes or move- ments. 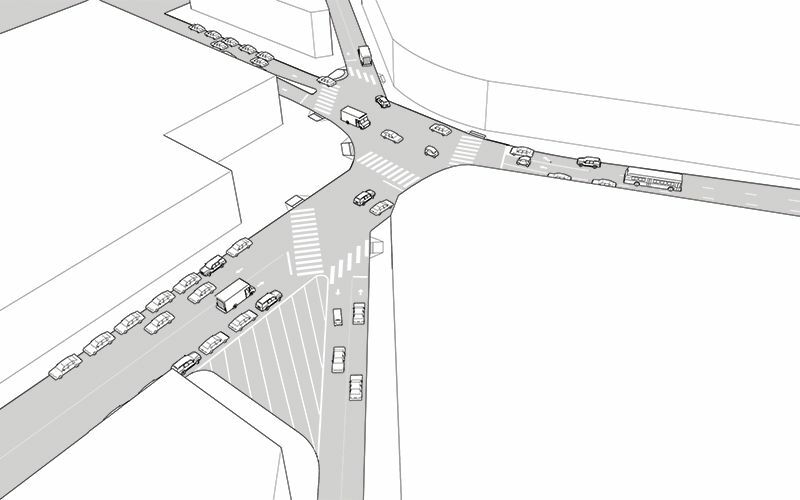 Does adding a protected left turn phase for vehicles reduce the available crossing time for pedestrians across the side street and encourage crossing against the walk signal? 1 Break complex intersections into multiple compact ones. Bend streets so that they meet at as close to a right angle as possible. 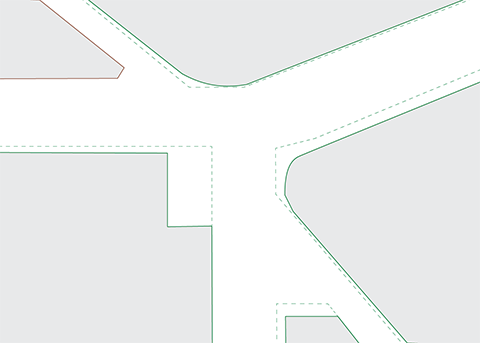 Maintain view corridors and sight lines for legibility and wayfinding. 2 Mirror turn lanes with curb extensions and medians. 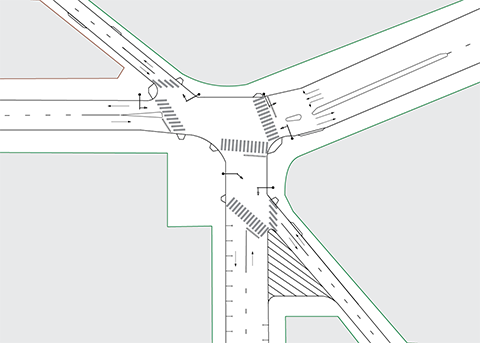 3 Align stop lines at all legs of the intersection to be perpendicular to the travel lanes, enhancing overall clarity and visibility for both vehicles and pedestrians. 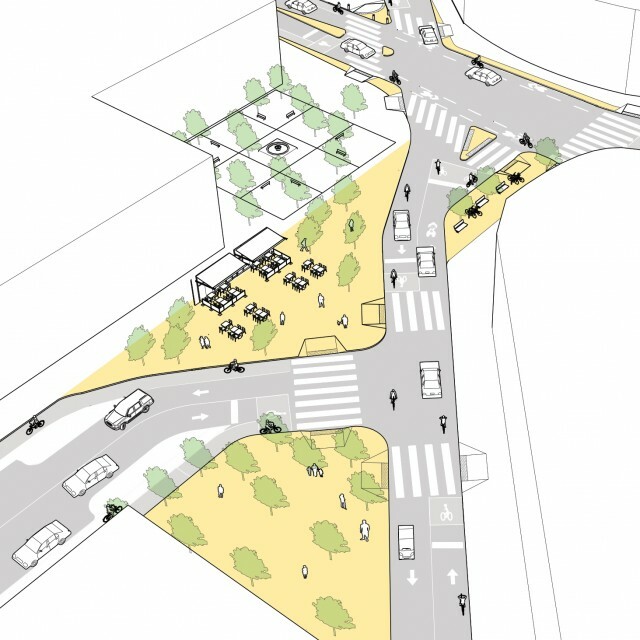 4 Minimize intersection size through the addition of curb extensions and medians. Minimize vehicle turning speeds using medians, realignment, and tight curb radii. 5 Reallocate space for bicyclists and pedestrians. Widen narrow sidewalks and add cycle tracks. 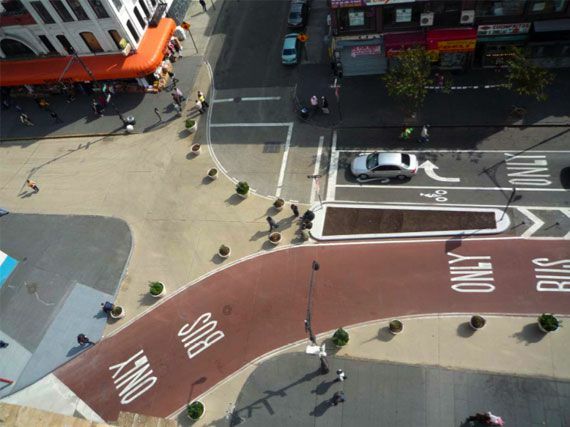 Realign crosswalks to meet the pedestrian desire line. Restrict vehicle turns at acute angled intersections with very low volumes. 6 Add median tips at crosswalks. Consolidate driveways to properties with multiple entry points. 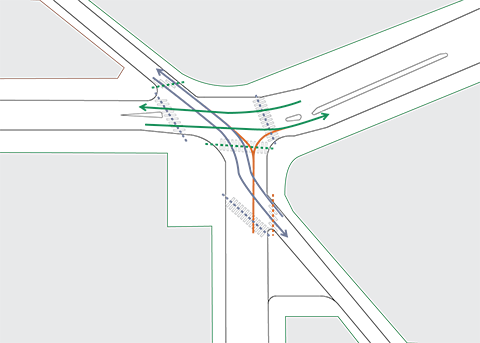 7 Close openings in medians that interfere with intersection operations. 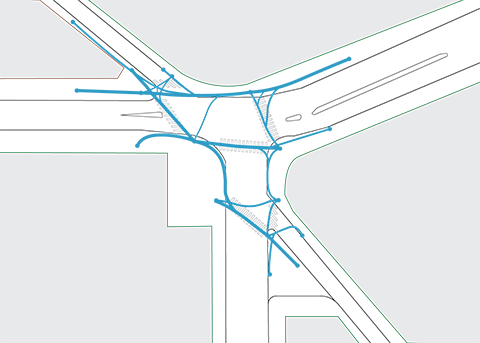 Where traffic volume data reveals excess vehicle capacity, reduce the number of lanes along a corridor, consolidate excess turn lanes, and eliminate slip lanes. 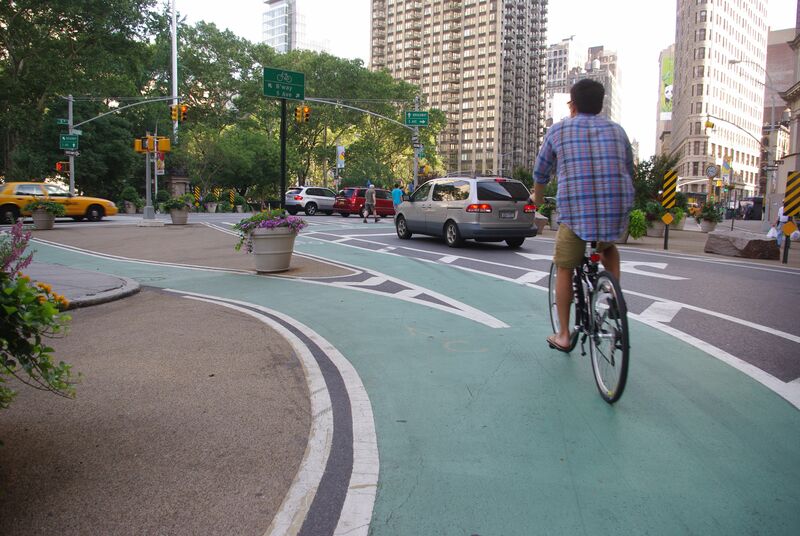 Reallocate space to medians, bicycle infrastructure, or sidewalks. 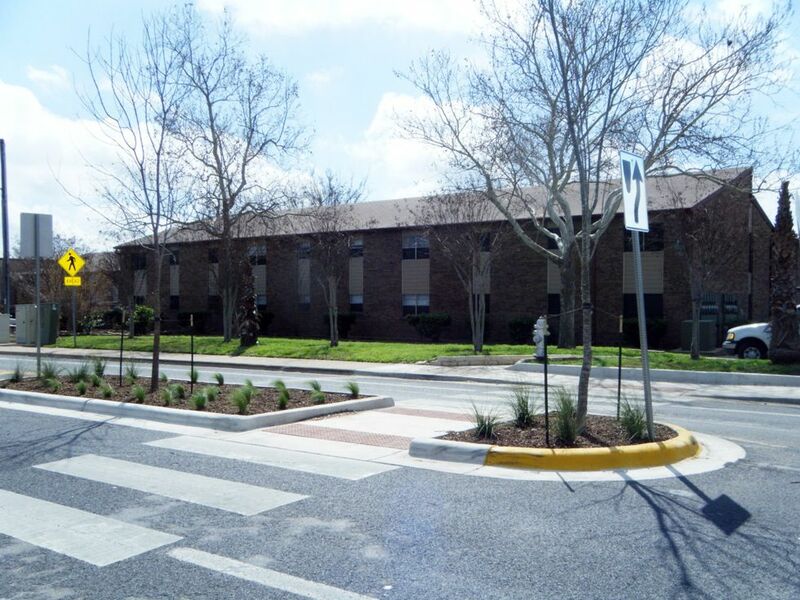 Utilize excess asphalt from the reconfiguration to create a public plaza. Low-cost materials may be used on an interim basis until full reconstruction and curb relocation. Evaluate the performance of the new configuration and adjust the design as necessary. 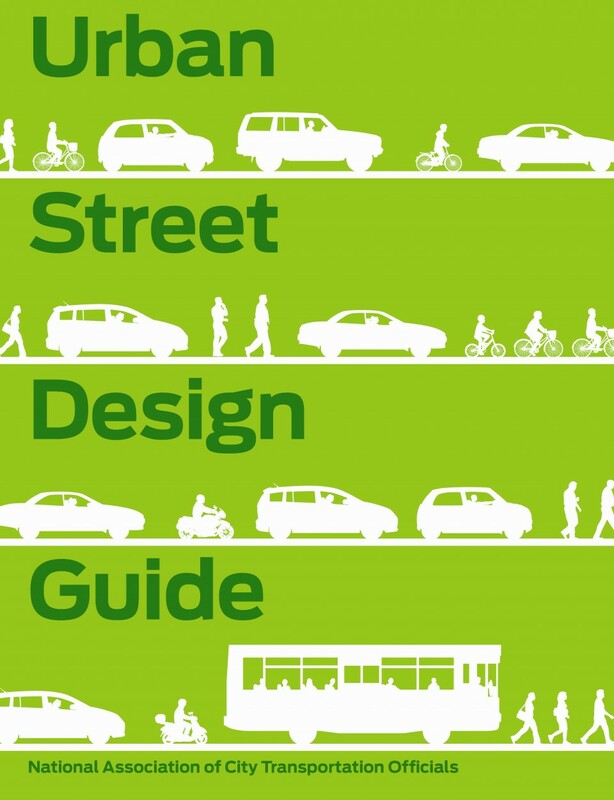 8 Assess and design the entire public realm in a holistic way to create one seamless pedestrian realm. 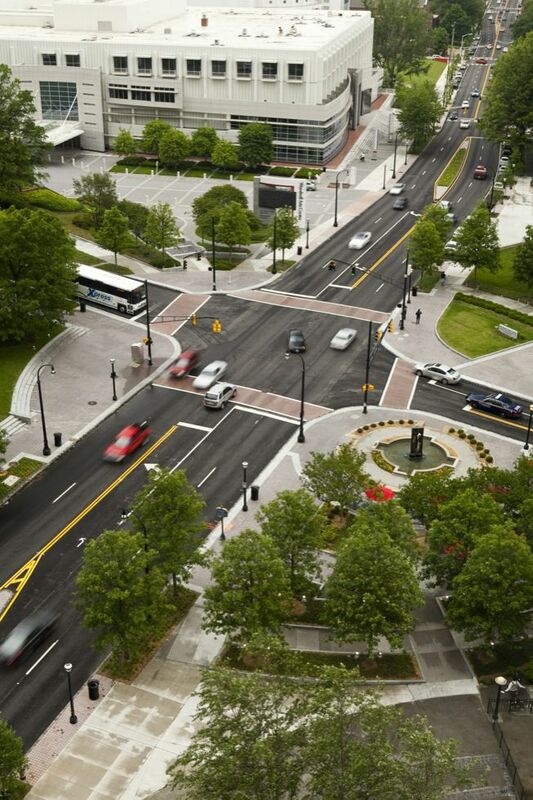 Integrate intersection design elements with the surrounding buildings and plazas. Enhance and take advantage of existing public spaces in the redesign area.